Last May, four-year-old Zac Oliver, who lives in the United Kingdom, was diagnosed with a rare form of leukemia. After his family learned that potentially life-saving treatment would not be covered by their medical provider, they turned to their community. The result was an amazing fundraising effort that involved everything from local bake sales to large donations by celebrities like Simon Cowell. The Daily Mail reports that the family succeeded in raising an astonishing £500,000 — or over $650,000 — after a mystery donor contributed £100,000. With the money raised, Zac’s parents, Hannah Oliver-Willets and Mark Garbett, will be able to fly him to the United States to undergo treatment with a specialist. 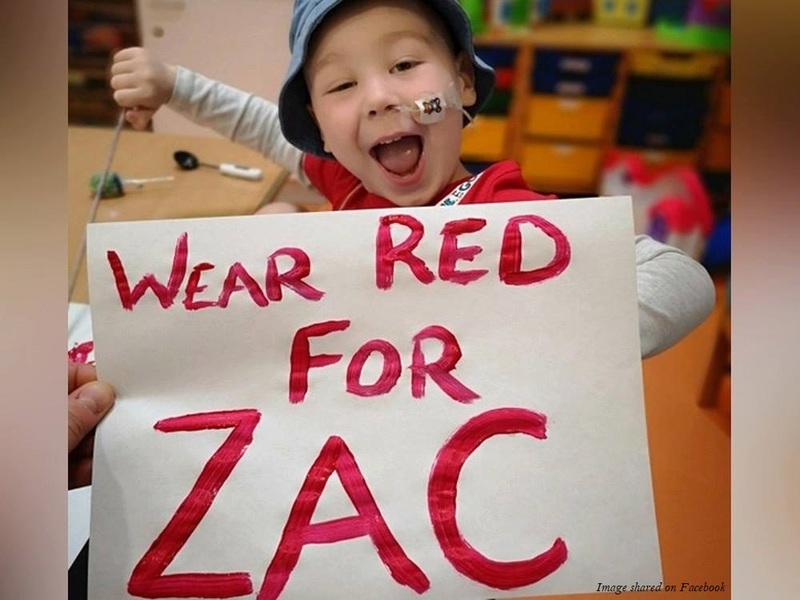 Zac suffers from acute lymphoblastic leukemia, and he is thought to be the only child in the United Kingdom with the Near-Haploid version of the disease. The condition is so rare that only about 200 children worldwide have it. Nonetheless, the treatment offered by the Children’s Hospital of Philadelphia is promising. The Daily Mail reports that doctors said the 17-week CAR T-cell therapy would improve Zac’s chance of survival from a mere 25 percent, on the only course of treatment available in the United Kingdom, to 60-80 percent. Zac lives in Shropshire in England, which falls under National Health Service (NHS) in the United Kingdom. In this socialized system of medicine, the NHS determines which forms of treatments will be paid for, and if something is not covered, patients have little recourse. Flying out of the country for treatment with a specialist can be extraordinarily expensive, if the country even allows it, and Zac’s family needs to have all of the money raised in their bank account to satisfy the hospital that they can pay and have the United States issue visas. Zac’s father said, “We have been in a state of shock since we found the money had been donated. Thank you so much to everyone who helped us.” Both parents are eager to get Zac safely to the US to begin treatment. Zac’s family plans to have him complete a week of chemotherapy in the UK and travel to the US after he has had a week to rest at home. Zac is not the only child to be denied treatment against the wishes of his family under the NHS. In recent years, Charlie Gard and Alfie Evans were both denied potentially life-saving experimental treatment. In those cases, both boys were hospital-bound, and the hospitals shockingly petitioned the courts and were granted the right not only to deny the treatment, but also to remove life-sustaining care against the wishes of the boys’ parents. As with Zac’s family, the families of Charlie and Alfie sought other medical opinions and treatment options. The families secured private funding — Charlie’s family raised more than $1.5 million — and found hospitals in other countries willing to take the boys for experimental treatments that held promise. And yet, because the boys were in the immediate care of hospitals, their families were denied the right to move them. The decision to give the hospitals power over life-and-death decisions rather than the children’s parents prompted large protests and international outrage. A story published by the BBC stated that the NHS has been asked to comment on the reason for denying Zac’s treatment, but did not include any statement from the NHS. Zac’s parents have said that the treatment he requires was deemed ineligible because his condition fails to meet criteria set by the NHS. Although the United States does not have a system of socialized medicine, there is concern that insurance companies can refuse to cover potentially life-saving treatments when less expensive (and less effective) options are available. This is especially a concern in the handful of states that have legalized assisted suicide. In a medical environment in which doctors administer lethal substances that end human lives, suicide is considered by some to be a valid “treatment” option. In California, Stephanie Packer became an outspoken critic of assisted suicide laws after her insurance company refused to pay for chemotherapy… but offered to pay for assisted suicide. Packer is now suing the district attorney in Riverside, California, for the enactment of a law legalizing assisted suicide. Packer’s case is likely not an isolated incident. A report earlier this year showed that Oregon’s assisted suicide law, considered to be a model for other states and nations of legislation with many “safeguards,” was intentionally crafted to include significant loopholes. Due to the sweeping and undefined language of the law, the Oregon Health Authority views the inability to pay for treatment as a reason a person may be eligible for assisted suicide. In other words, if an insurance company refuses to pay for a highly effective form of treatment, the patient can opt to have a doctor assist in ending his or her life through suicide, while a patient with the same condition whose insurance company agreed to pay for the treatment would not be eligible to be killed by assisted suicide. Assisted suicide is no longer limited to adults. Several nations have already legalized assisted suicide for minors or are considering it. Since it was made legal in Belgium, three children have been killed. Zac Oliver’s story is a beautiful example of what can happen when a community comes together. His story is also a warning of the frightening power the United Kingdom, the NHS, and private insurers in other countries have over potentially life-and-death decisions. When this dangerous power is coupled with legalized assisted suicide, vulnerable patients may lose the right to make their own medical decisions… and the right to life.